A sombre tune floods the theatre and there is a sense of foreboding in the air. For a while, there is no movement on stage. Then, four dancers stepped out from the shadows of the curtains. The spotlight falls on the boards in their hands, and the audience catches sight of the images printed on the placards that depict heartbreaking images of starving children. There is one showing a child’s palms turned up, a meagre handful of rice in her hands. Another shows emaciated children queuing for food with hungry expressions on their faces. The last is the famous Pulitzer-prize winner depicting a starving child stalked by a vulture. As the dance progresses, with each turn of their heads, each graceful hand gesture, each leap across the stage, the dancers paint a gloomy picture of the scenes of hunger in modern-day India– one of famished beggars out on the streets and passers-by who have grown desensitized. When the last note of the first song echoes throughout the theatre, the movement of the dancers on stage comes to a halt, their bodies bent, arms spread, faces frozen into expressions of pain and unspoken anguish. Then without warning, all 14 dancers turn and begin stamping their feet to a steady beat. Anger, the main emotion the dancers wish to express through the second half of their dance, forms the connection between every sharp turn, every powerful thrust of the hand. The dance speeds up, each underlying shift in the music forcing their bodies to undergo a thousand changes: their legs cross, their heads dips, their fingers morph to from a classical hasta into the shape of a flower, all in a complicated synchrony. Maintaining their lines of formation, the dancers use traditional Bharathanatyam footwork to maneuver their way across the stage, striking their final poses with their hands stretched out and bodies reaching forward. They smile benevolently, their serene expressions a sharp contrast with the angry frowns they had worn just moments ago. The narrator delivers a single question for the audience to ponder over. “Can we do more?” it asks. The music fades, but the energy of the dance still reverberates about the room. RI Indian Dance exits the stage amidst overwhelming applause. Titled “Pasi“, or “Hunger”, the dance depicted the desperation and indignation acutely felt by many hungry individuals around the world. Choreographed by the CCA’s resident choreographer, Mrs Sreedevy Sivarajasinga, it was a bold mixture of both classical and contemporary Indian dance movements. There was a great deal of dramatization involved and an extensive use of props- a coconut was even smashed onto the stage at one point of time and was thereby hungrily “devoured” by dancers playing the role of beggars. However, while it was not uncommon for schools to explore different dance styles, what set RI Indian Dance apart from the other institutions participating in the SYF would be their unconventional choice of theme, which added depth to their choreography. Through the symbolic hand gestures, the intricate layering of dance steps and the canonical facial expressions that were so characteristic of Indian Dance, the dancers questioned the prevalence of hunger in our world and challenged the audience to consider an alternative perspective to a social issue close to the hearts of many in the India. The question of the day, as aptly put across by Mrs Sreedevy Sivarajasinga, is why hunger continues to persist even though the world is able to produce enough food to feed the global population. RI Indian dance before their performance. Initially, the dancers were worried that they would not be able to get the message across to the audience. Thankfully, they seemed to have achieved their desired effect. “The dance was an angsty one that was executed with genuine passion and sincerity. Due to the theme of the dance, the steps involved were quite complex but nevertheless neatly showcased,” a member of the audience (M Kothai Niveda from NTU) commented. With thought-provoking and skillful performance, Indian Dance was able to bring home a Distinction award. Vice-Chairperson Kalyanni of class 15S06K tells Press that “With only a few trained members in the CCA, the dance came across as a rather challenging one for many of the members. The choreography comprised of many complex steps that were initially hard to perfect. Nonetheless, everyone worked immensely hard and with their hard work, staged a successful performance! 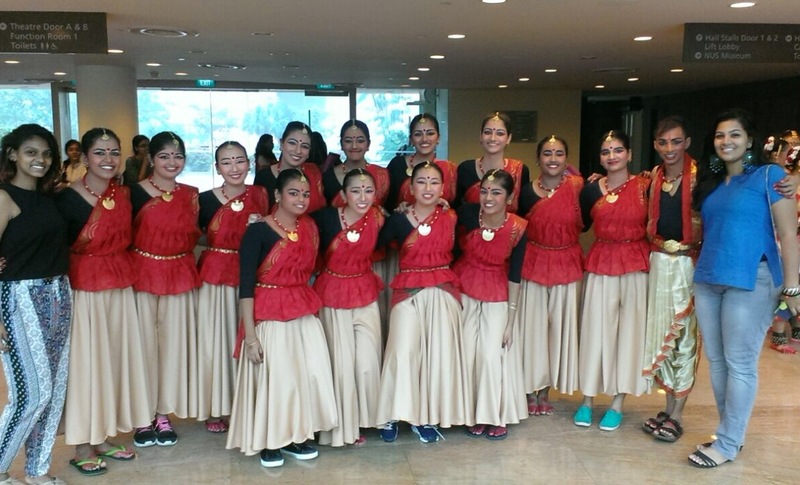 The CCA had indeed worked together to help each other and had strived to bring out their best.” With continuous effort and perseverance, the Indian Dancers will surely go far, and we at Raffles Press wish them all the best for their future endeavors!